The Island’s largest local real estate company, Bermuda Realty [trading as Coldwell Banker Bermuda Realty] played host this week to facilitators Malika Musson, Korrin Lightbourne, and Corey Butterfield representing both the Bermuda Hospitality Institute and the Bermuda Tourism Authority. 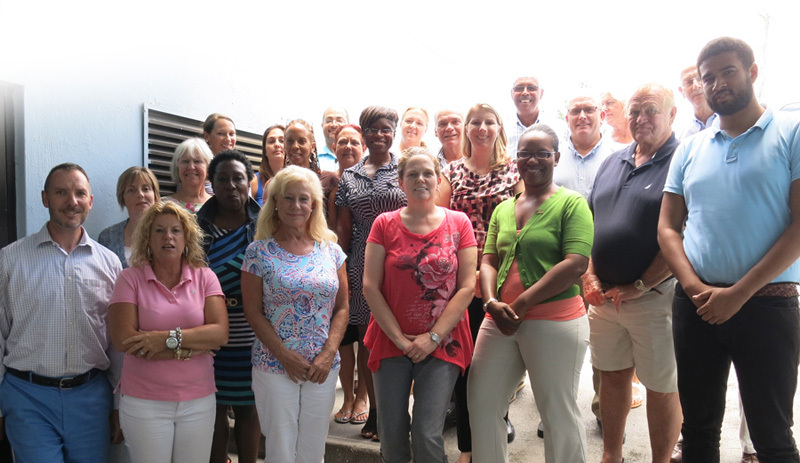 Coldwell Banker Bermuda Realty became the first real estate company in Bermuda to have nearly all their licensed agents complete the Bermuda Tourism Ambassador Programme and the Blue Flag Ambassador Programme. On Thursday, June 25, twenty-two staff members became Certified Tourism Ambassadors [CTA] – an international designation in the hospitality industry. The certification is designed to enhance the quality of the visitors’ experience. The Certified Tourism Ambassador TM [CTA] is a symbol of quality that represents a Company’s commitment to building a better Bermuda by turning ever visitor encounter into a positive experience. Susan Thompson, Agency Manager elaborated on the connection between tourism and real estate, saying: “Like the tourism industry, real estate is about people and creating a great customer experience. “The programme is geared toward initial certification followed by renewal of certification every year thereafter,” the company said. “This ensures that CTAs are kept up-to-date on important new developments and that they demonstrate a willingness to assume responsibility for continuing to learn about the great things the island has to offer. “Certification renewal requirement will be established on an annual basis by the Tourism Ambassador Institute, in cooperation with the Bermuda Tourism Authority. “Tourism accounts for more than 575,000 visitors yearly; more than $289 million in economic impact and creates over 3,500 jobs. A lot of what visitors feel, remember and tell others depend on the experience they had while they were here. Therefore, all of us are key to the experience and having the knowledge is the first step. Coldwell Banker Bermuda Realty is a trade name of Bermuda Realty Company Limited, serving Bermuda’s real estate and land surveying needs for more than a quarter of a century.